The late Danish-British engineer Ove Arup was responsible for some of the world’s most iconic buildings. He didn’t design them; he built them. Before his death in 1988, Arup brought his groundbreaking techniques to realise projects from the penguin pool at London Zoo to the Sydney Opera House. The firm he founded is now a multinational empire whose current projects include Crossrail. In short, Arup is a very big deal. Even so, this show might be a hard sell. Engineers are quiet achievers, overshadowed by architects and designers. Everyone knows it takes innovation and imagination to design a beautiful building. The show’s prototypes, models, drawings, photographs and films make it clear that those skills are also crucial for those who make buildings work. 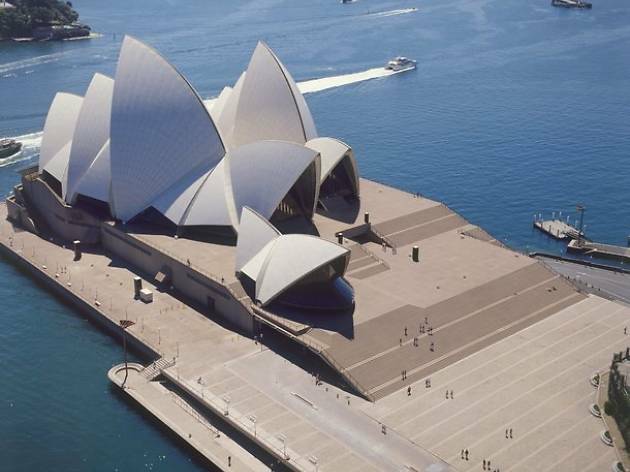 The Sydney Opera House could never have been built without Arup. Commissioned in 1957, it was finally completed in 1973. Through the ’50s and ’60s, Arup and his team went through plan after plan, trying to find a way to build the now-famous shells. They finally cracked it using a computer – a pioneering approach that transformed the way engineers work. That computer – a colossal box – is on display at the V&A alongside tanks of gurgling algae, a more recent Arup innovation that uses photosynthesis to heat buildings. The emphasis here is on Arup and his company’s huge projects, but small details provide a glimpse into his personality: his own slides of the Opera House under construction; his doodles and party invitations. Arup once said that design is all about ‘defining a sensible way of building’. ‘Engineering the World’ builds a picture of man with a knack for applying blue-sky thinking to the most down-to-earth problems. The Ove Arup exhibit at the V&A is only on until November 6 and it’s well worth a visit. As a civil engineer I may be a bit biased, but I found the whole show so inspiring and fascinating. Arup was such a charismatic and creative genius who really shook up the engineering conventions of his time. Throughout the 20th century, he had a hand in designing everything from bomb shelters to art galleries to medical centres. There are displays showcasing some of his most famous works including the HSBC headquarters in Hong Kong, the Pompidou Centre and most notably the Sydney Opera House. Arup pioneered the idea of architects and engineers working more closely together and he also had the foresight to start using computers in their very early days to carry out calculations. Although there are so many fascinating technical displays on show at the exhibit, I think the item that stuck out most to me was a collage that Arup put together incorporating some of his own poetry. Arup was such a multitalented individual and this exhibit gives insight into his world as well as showing off the legacy that he left behind. What an exceptional exhibition 'Engineering the World: Ove Arup and the Philosophy of Total Design' is displayed at the Victoria & Albert Museum. It's a step into the world of Ove Arup, the world of architectural design and the world of engineering. I didn't know what to expect and I really didn't know who Ove Arup was at the time. So when I visited the exhibition, I then remembered the Sydney Opera House and it rang a bell. Ove Arup's philosophy of work has always been astonishing. He developed and revolutionised engineering to create phenomenal structural, constructed sites. Centre Pompidou in Paris is also a prominent statement at the exhibition as it's designed around the same structural base. I just loved how you step into such an inventive mind as Arup. The stairs, the bars just really are quite fascinating and I always question how this is done. This exhibition really goes in depth into how pieces of metal create a stable structure. You really go inside the whole aesthetic of the Sydney Opera House which is quite interesting. You see pieces of design, original pieces of initial engineering documents. Developing pieces of architectural prototypes. Pieces of how the Opera House was created, the model of the roof, which I found incredibly detailed. The lines that join together to create such a complex shape to achieve such a diverse building. Miniature prototype buildings are also exhibited at the exhibition. Ove Arup created an empire of change for the world, for the environment and I truly learnt quite a bit from experiencing a different, but extremely intriguing industry. I really loved the sound room where you will get to experience how sound is spread across a theatre on the inside from different angles. Depending on how it's built and where your situated, the sound can vary. Technology nowadays has revolutionised the world. Engineers out there around the world design the best of structure and material. I have seen so many buildings that I've found inspirational for my work. Without it, the world wouldn't be the same. Go and experience the world of engineering while you can. Tickets are a great deal.